This Exclusive interview with Felicity Jones of Rogue One: A Star Wars Story is part of an expenses paid press event I attended. Last weekend as part of a press event, I boarded a nondescript looking black bus and was taken to LucasFilm Headquarters just outside of San Francisco, Ca. Passing the famous Yoda Fountain, and walking through the lobby displays were truly surreal–it was quite an experience. In a small screening room that was essentially a movie theater, we sat and waited for the “talent” to come in–the cast of Rogue One: A Star Wars Story, one at a time. Rogue One: A Star Wars Story… Jyn Erso (Felicity Jones)..Ph: Film Frame ILM/Lucasfilm..©2016 Lucasfilm Ltd. All Rights Reserved. Some quotes have been paraphrased for readability. Our only female interview of the day was Felicity Jones, who plays Jyn in Rogue One: A Star Wars Story. She was such a kind person, and so very down to earth. Felicity played a powerful role in Rogue One–I can’t wait for you to see it. She’s the next role model for your daughters–a character who has had a hard life filled with struggle from an early age, but learns to step up and rise above her past to be a leader for others in the rebellion. She’s had a bit of a hard life, and there’s been quite a lot of struggle so it’s not easy for her to trust people. Throughout the film you see her actually forming these kindred spirits with the other rebels–finding something that they all have–a common dislike of the empire. They unite over that despite their differences. The training involved in Rogue One: A Star Wars Story was intense for Felicity. She performed her own stunts and acrobatics and admits that it was rough, especially at the beginning. She was covered with bruises that she didn’t quite notice until after the fact. There’s a lot you don’t realize because the adrenaline is pumping. Then you get home and you have enormous bruises all over. In a way I probably brought it upon myself because I get really into the acting and take it very seriously. Star Wars is a cult film series at this point. 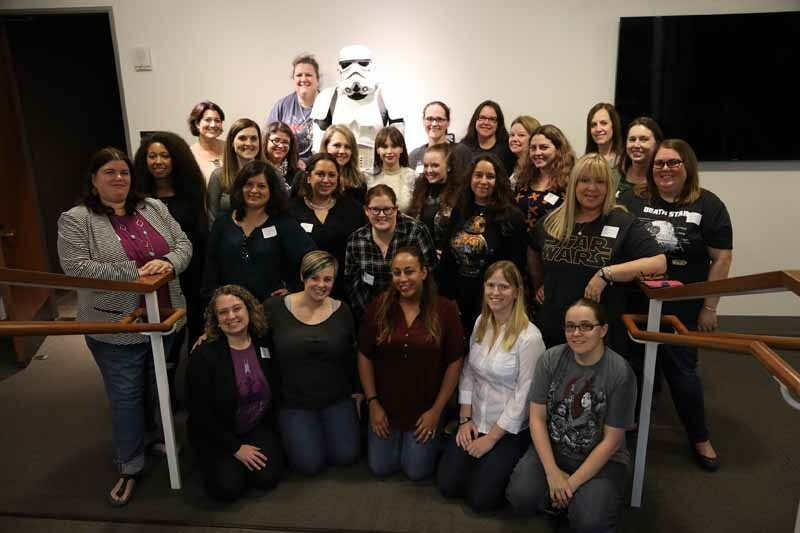 The actors and actresses that we chatted with at LucasFilm aren’t the hallmark “Star Wars crew,” if you will. They’re new to the series, which makes it an incredible movie to watch. We were able to chat with Felicity about what it means to her to be cast in a Star Wars film. I feel the reason Star Wars has lasted for so long is because it’s about family, and not just blood relations. It’s family–the family that you form with friends. I think what’s so special about it is those friendships are across different races and different languages, but it’s about people who come together, united by fighting the forces of evil. Rogue One: A Star Wars Story comes to theaters December 16th. 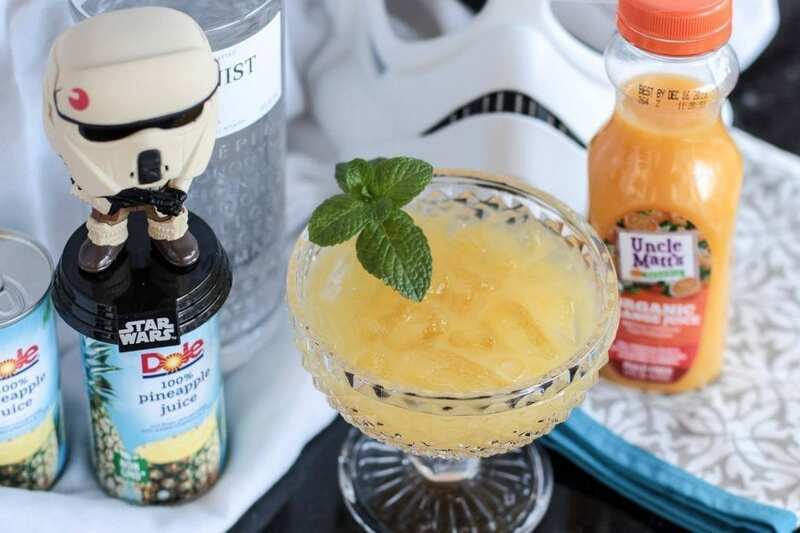 At our press reception at Skywalker Ranch, after we were able to screen a bit of footage from Rogue One, they served Gin & Juice… or, actually… Jyn & Juice. Stop signing Snoop Dogg for a second and go grab the ingredients for this drink. 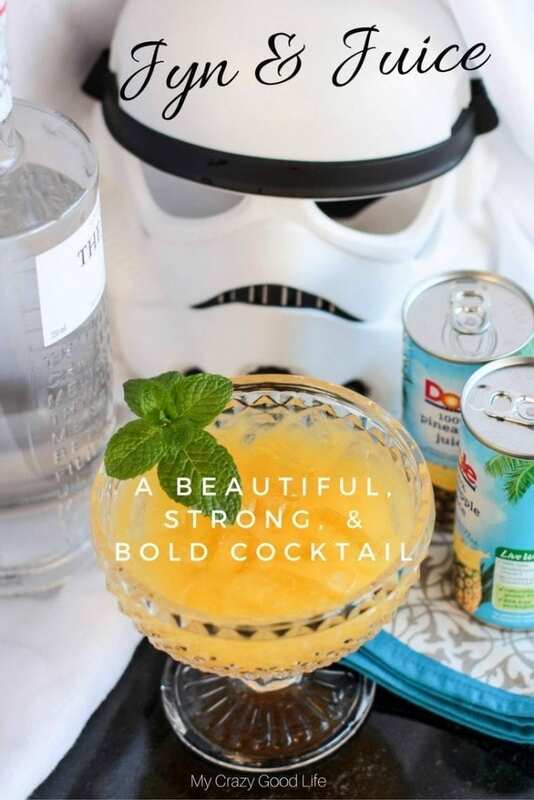 In a cocktail shaker add Triple Sec, Botanist Gin, pineapple juice, orange juice, and top with crushed ice. This expenses paid trip to San Francisco is paid for by Disney, Lucasfilm, and Disney Junior and is offered in exchange for my coverage about the events. No other compensation is given. Of course, opinions and experiences are my own. 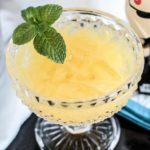 Gin and Juice is a classic cocktail. 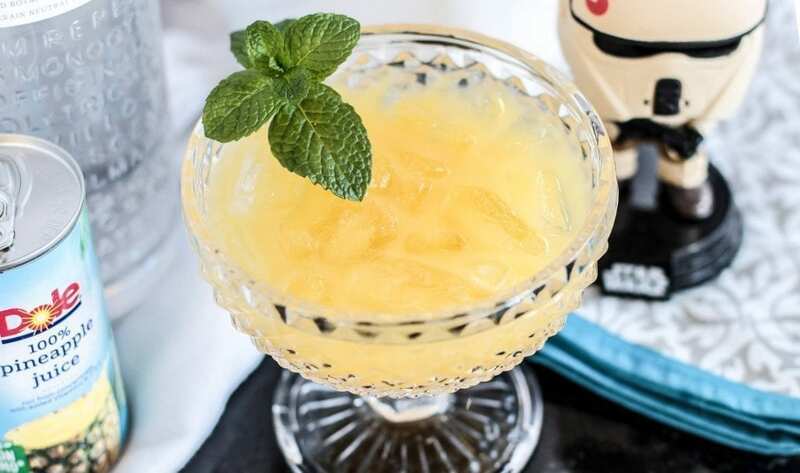 Jyn & Juice, however, is beautiful, bold, and strong–just like Felicity Jones' character in Rogue One: A Star Wars Story.